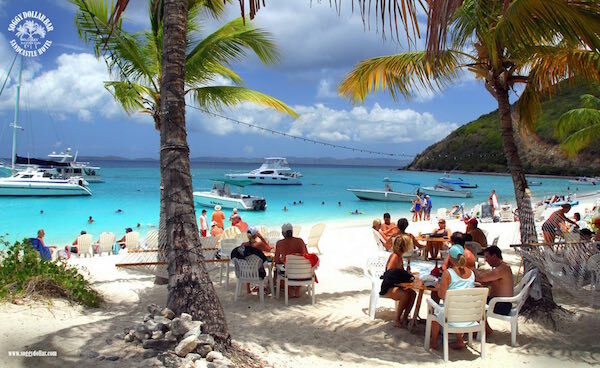 The Virgin Islands are famous not just for gorgeous beaches…they’re well know for their epic beach bars…and at the top of the list is Soggy Dollar Bar on White Bay in Jost Van Dyke, BVI. When you think of going to a bar, you think of loud techno music, crowds, long waits for a table (if you can get one) and mediocre service, right? The main purpose of going to that bar is to get a cocktail—or cocktails-right again? Well, you can certainly get a cocktail at the Soggy Dollar–in fact, probably some of the best cocktails on earth are made here–but the drinks are only a small part of what makes up the Soggy Dollar experience. It really doesn’t match the traditional meaning of the word “bar.” You don’t just go for an hour or two—you go for the day. And it’s not just for a drink—it’s to soak up the sun on the world’s most beautiful beach, cool off in crystal clear waters, eat great food, and meet amazing people from all over the world. A day at the Soggy Dollar Bar is more like a beach party, and everyone is welcome—children, grandparents, friends, family—all these people make up the fabric of the Soggy Dollar Bar. So, we’re calling it the Soggy Dollar Experience. As you come into White Bay on Jost Van Dyke, you’ll join the “luckiest people on earth” club–the patrons of Soggy Dollar. Since there’s no dock, the way to the bar is to hop off the boat and swim through the water–hence the name, Soggy Dollar. Most patrons jump in the water and enjoy a short swim to the shore, getting their money wet. Upon arrival at the bar,well, you’ve got Soggy Dollars! The bar is basic; open to the elements on two sides, with a couple of bar stools and a lively group of bartenders. Order a Painkiller. The Painkiller originated at Soggy Dollar in the 1970’s and is the perfect concoction of dark rum, cream de coconut, pineapple and orange juice, topped with fresh grated nutmeg. When you pay, there’s a clothes line where the bartenders will clip your soggy dollars to dry before burying them in the register. The choice of cocktail is the easy part…now, what to do next? You could meet some new friends by joining the group floating in the water sipping Painkillers (there’s always a group floating in the water sipping Painkillers), or get in on the volleyball game, or just climb into a nearby hammock and let the gentle breeze rock you to sleep. Or, you could try your hand at the Ring Game, a Soggy Dollar favorite. No one really knows how or when the Ring Game started, but rumor has it that Blackbeard and his crew played the game on their ship–using the bones of their victims and a noose made of hemp. Regardless, the game has been played for generations and is actually pretty simple in concept. A ring is tied to a string, which hangs from a tree. A nail, or hook, is hammered into the trunk of the tree. The goal is to toss the ring and catch it on the hook. Sounds easy, right? Give it a try. Weekends frequently feature live entertainment by locals–you’re welcome to sing along–and a fantastic BBQ featuring delicious burgers and locally caught fresh fish. The vibe is totally laid back, and the crowd can go from mellow to wild depending on the day and the crowd. The motto at Soggy Dollar is relax and enjoy, so plan to leave the world behind when you arrive at this Caribbean jewel.